It’s always dangerous to be monkeying around when driving a vehicle – but having an actual monkey behind the wheel is a whole new level of risky, so it’s no wonder a bus driver got suspended for letting a monkey take the wheel. The driver was on his bus route in Karnataka state, India, when a monkey came on board with another passenger – which is probably enough to set off alarm bells in the first place, but it only went downhill from there. The animal was said to be a langur monkey, a long-tailed arboreal Asian monkey with a characteristic loud call. It refused to sit anywhere other than up front with the driver, which is breaking a rule in itself on a bus. Passengers definitely aren’t supposed to be in front of the white line while the bus is moving. Not only did the bus driver let the monkey sit on his lap, but he actually let the little animal take the wheel of the bus – for about 10 minutes! To be fair, it’s quite impressive how the monkey didn’t crash in that time; I can confidently say it didn’t have a bus driver’s license. 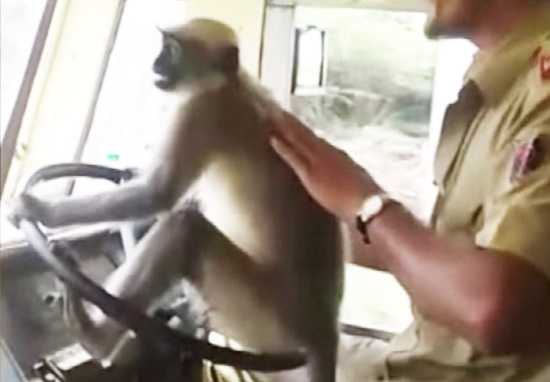 According to Vice, the bus driver let the monkey sit on the wheel and steer as it wove its way through traffic around Davanagere, 270 kilometres from the regional capital of Bangalore. Of course, the monkey couldn’t reach the pedals while he was driving, so the human driver took care of gear changes and speed. The shocking scene was captured on video and put online, where the person who shared the video explained authorities were investigating the situation. The Divisional Controller of the Karnataka State Road Transport Corporation (KSRTC) said that the department is looking into the incident because of the number of calls they were receiving, even though there were no complaints filed against the driver. I can’t believe no one complained about the driver! Are monkeys known to be particularly good bus drivers? The (human) bus driver has since been suspended for his decision to let the monkey drive the bus. Driver M Prakash has been taken off duty for allowing the monkey to sit on the steering wheel and handle it. Passengers’ safety is paramount and the driver cannot risk it by allowing a monkey on the steering.